Base key from Shapeways, then I dyed the translucent plastic purple (iPoly Dye) and used silver paint and Molotow chrome on the shiny bits. Very nice. How long did you let it set in the dye, and how did you get it to be so smooth? Not long, I brought the dye to a boil in the microwave, then waited maybe half an hour to let the dye settle in. Fortunately, the frosted detail plastic has a high melting point. There was very little shaping needed, it came out quite smooth in the detail plastic. Who did you have make this Key? And who's Key is it? I was wanting to 3D print my own Transformers, and one of them was Sideways from Cybertron. 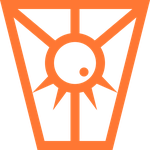 Since Sideways and Soundwave both have this symbol on them, I figured that it was the symbol for Planet X. Prize Inside/Octavirate Forge on Shapeways made the key. It's a special edition for the AllSpark.com using their symbol.